First of all: I'm off this week. All week! Yay!!! I just needed some time out (even from blogging, as my sporadic posting over the last couple of weeks illustrates so well) and am taking a week's vacation from work. My plans? Doing nothing. Or rather, only do the things I feel like doing. And if that means looking at the sky or having a three-hour nap every afternoon, so be it. I am looking forward to just drift for a few days. Sometimes, I am absolutely stumped about what to do with the contents of my weekly organic vegetable bag. Sometimes, I have an epiphany and a little kitchen magic happens. Last week was epiphany-time. I had some leftover chard from a previous delivery, and the new bag came with a few bulbs of fresh, green garlic. I also remembered I had seen some ready-made pastry in the freezer when rummaging for food the other day, and thus felt inspired to make a quiche. Green garlic is just young garlic, picked before the cloves have started forming. It is milder than mature garlic and works well in a dish like this, a pasta sauce or a stir fry. If you cannot get young garlic, you could maybe substitute with red onions or shallots, adding a bit of regular garlic when frying them. Instead of chard you could use a similar vegetable like spinach or beet greens. The pictures are pretty crap, because I took them with my phone. I was hungry and wanted to eat and did not have the will to go get my proper camera. 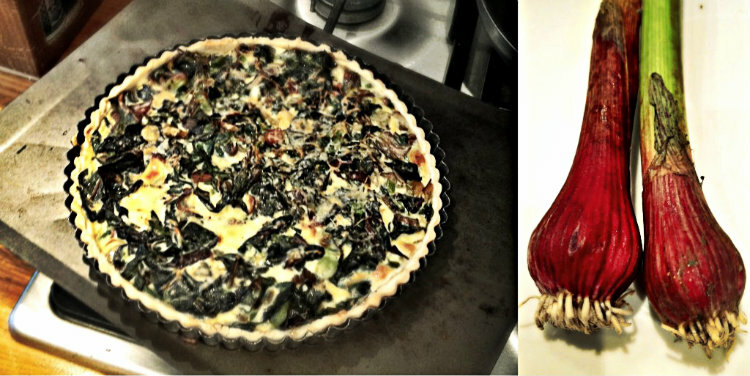 But this quiche was quite good, even if I say so myself, so I wanted to share. I had it with a simple salad, warm for dinner and then cold for lunch the next day and I would definitely make it again! Lay the pastry over a tart tin and ease it into it, making sure to fit it neatly into the fluted rim. You can trim any overlap with a rolling pin that you gently push across the top around the edge of the tin. Prick the bottom of the pastry all over with a fork. Heat the olive oil in a pan, add the garlic, add a generous amount of salt and sauté over a low heat until the garlic starts to soften, about 5 to 10 minutes. Add the chard and marjoram and heat through until the chard starts wilting. Season to taste with lots of black pepper and a bit more salt if you like. Take off the heat and set aside. In a small bowl, whisk the eggs with the milk. Evenly scatter the garlic and chard over the bottom of your pastry and then pour over the egg mixture. Grate a little bit of cheddar over the top. Place the quiche in the preheated oven and cook for 20 minutes or until the egg has set and the top is starting to turn a golden brown. I made a version of this last night, inspired by your post. I only had Filo pastry so I had to improvise a bit and create a wall of beans to keep the eggy-cheesey yuminess contained. Delicious! oooh I must try this! You're such an excellent baker! I'm so impressed and inspired now! !